As a total beginner with no fight experience, the very idea of fighting was surreal, because it wasn’t something I’d openly spoken about doing. Everyone who knew me knew that I was into Muay Thai, and although people had asked me about fighting, and I knew that I wanted to, I never really discussed it with anyone. Since I’d had my first training session, just a year prior to this, I had known that I wanted to fight. However, when the time came for it to actually happen, I still found myself in awe that it was actually happening. Not only was I having my first fight, but I was skipping the usual phase of amateur bouts, where fighters are eased into the unfamiliar situation of a real fight by the use of shin guards, head guards and elbow pads, and jumping straight into the deep end. 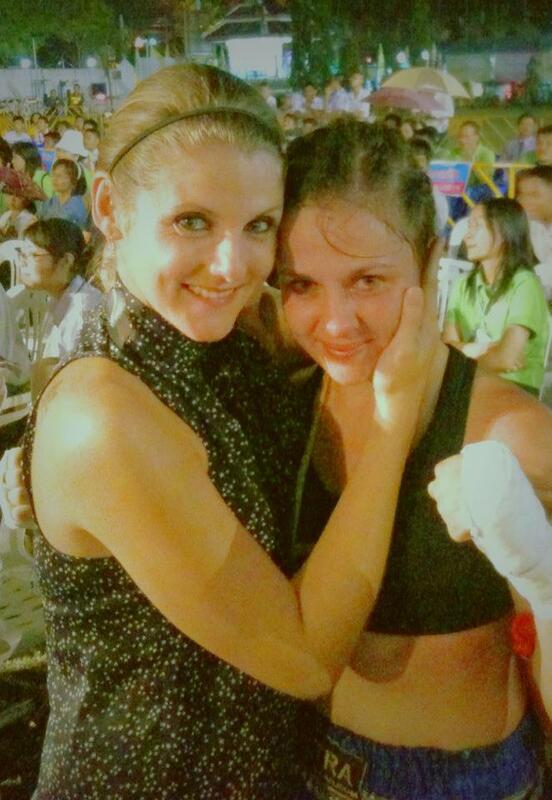 I was fighting full rules Muay Thai in Thailand against a Thai opponent. That being said, it was shortened to only three rounds. At the time of writing, it’s around 15 months later, so I will try and retell the experience as accurately as I can. I still remember when Master Toddy came up to me at the start of an afternoon training session on 17th January 2012 and told me that I’d be fighting exactly one month later. He said it as if it was no big deal at all, but to me it was huge. I’d always expected to need to spend months and months doing extensive training to possibly ready for a fight, and wondered how I could possibly be ready for this one in just one. Although I’d first started training one year earlier, it hadn’t been consistent. I’d spent patches of time here and there training in between working and travelling, so hadn’t been able to gain much skill in that time. In fact, after I’d started training with Master Toddy, I’d realise that the previous gyms I’d been to had taught me barely anything at all in comparison to him. So, in reality, I only really had less than two months of training in total to prepare myself. Even at that time, I knew that no matter how long I was to spend training for it, I would never feel ready. I just needed to get in the ring, see how it felt, and go from there. There was, of course, the lingering question of whether I would have some sort of terrible experience and be put off after the first one, but I already knew that wouldn’t be the case. On the day, I didn’t experience any of the pre-fight nerves that I expected, I just wanted to get it done. Although, one concern that I did have, and I think this is a common one for fight virgins, was my cardio. I was worried about totally losing my self-control and exhausting myself too early on in the fight. When it came to it, each time I went back to the corner, I felt like I was going to die. Well, that might be a slight exaggeration, but I’d never known exhaustion like that before. I think the adrenaline of the situation drained the energy from me more quickly than it should have. While some fighters struggle to focus on the instructions from their corner, I heard every single word that came from mine, loud and clear. However, putting those words into action was not quite as easy. It was almost as if there was something in between my brain and my body that stopped them from working together, and all the techniques I’d been practicing religiously had somehow fallen out of my brain when the bell rang. Nevertheless, after three rounds, I won the fight on points. This fight was something that I needed in order test what I’d learned and to take the next step, but for me, it was much more than that. Muay Thai was a passion of mine that all my friends knew about, but none understood. Outside of the gym, I struggled to find common ground with people when I spoke about it. This was my opportunity to show those people what I’d been talking about all that time, and how serious I was about it. My friends always seemed confused as to why I’d turned down invites for nights out and junk food to train, and I wanted them to see why. Although they said that I was crazy for wanting to fight, they showed an overwhelming amount of support on the day. I certainly felt emotional as I stepped out of the ring after winning, but when they ran over to congratulate me, I was pushed over the edge. Previously, I’d gained a reputation amongst my friends for having a ‘heart of stone’, since I’m usually quite straight-faced and emotionally awkward. However, at this particular point, I couldn’t help but cry. Knowing that I’d not only achieved something I’d only ever dreamed of doing, but had also made my friends proud of me, was a great feeling. When I first started Muay Thai, I thought that I’d have just one fight, just to tick the box and move on to something else. However, as soon I’d had this one, I knew that it wouldn’t be my last. Hey there, so you did your first fight after 2 months of training. Thanks for reading! That is correct. It doesn’t sound like any time at all when you put it like that, especially since it was full rules and my first experience of any kind of fighting. Sometimes, jumping in at the deep end is the best way! Nong New has a bright future in muay thai.